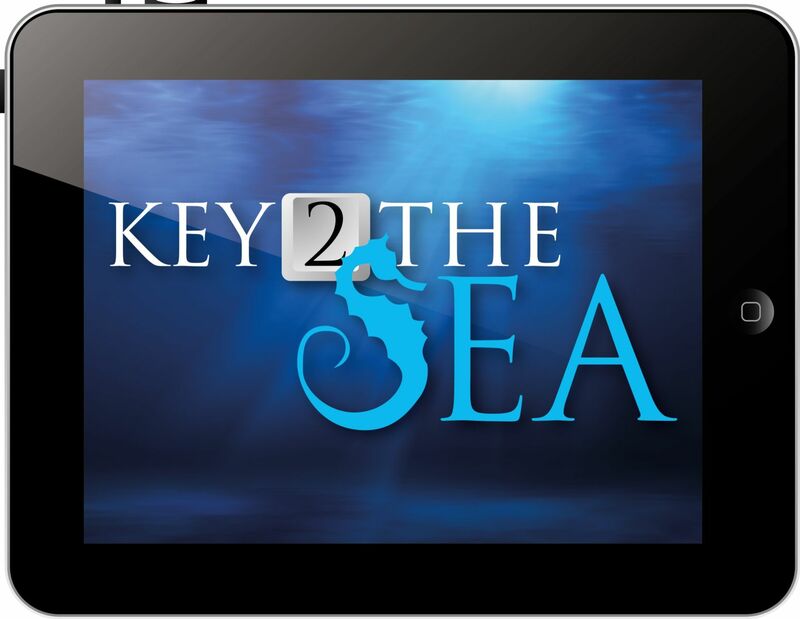 Recently ResourceLink staff have been involved in two Kids Connect conferences: Key to the Sea run by Unity College and Tech on the Edge, run by St Thomas School at Camp Hill. Unity College hosted Key to the Sea at Underwater World, the well known marine aquarium at Mooloolaba, while Tech on the Edge was held at The Edge, which is an initiative of State Library of Queensland which provides space and equipment for users to explore creativity across the arts, technology, science and enterprise. This year, we decided to implement some recent work we had done with Michelle Anstey and Geoff Bull on multiliteracies, focusing particularly on supporting students to develop a multimodal text, in this case a trailer for a movie, using the iMovie app, as well as supporting apps such as Word Foto and Storyboarder. Edge of Your Seats: The Movie Mystery Box! Be taken to the edge of your creativity by diving into the Movie Mystery Box. Armed with a mobile device and the contents of the Mystery Box, you will be challenged to create a short film inspired by a famous movie. Become a professional movie maker as you script, shoot and star in your own film, created entirely on an iPad. Learn tips and tricks from movie making professionals to start you on your way to Hollywood. The key to assisting the students to develop really quality end products lay in the learning that took place prior to the students beginning to film. We began by showing the students a short and amusing advertisement. 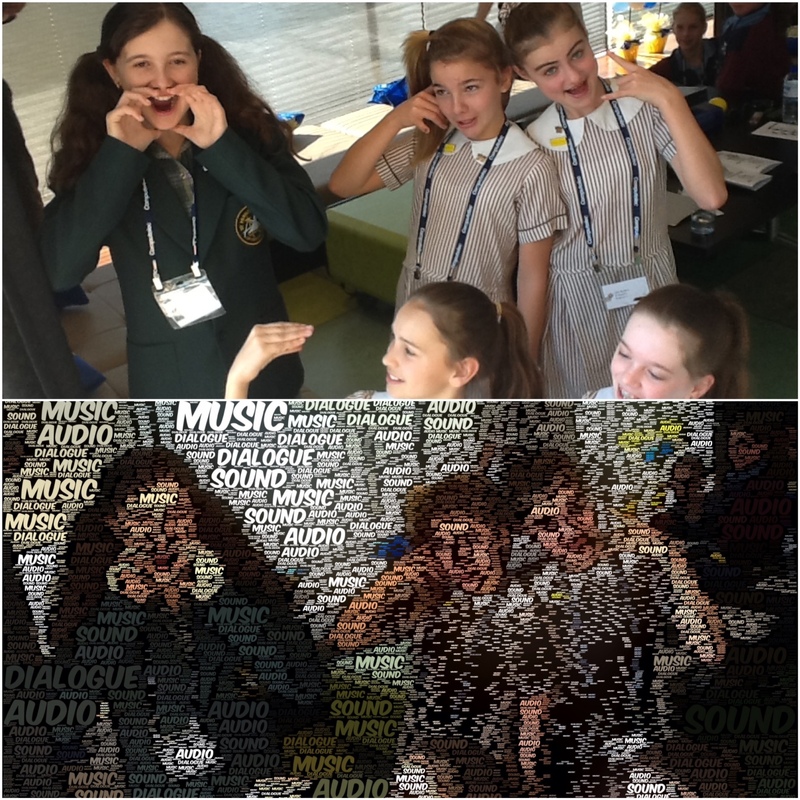 Students model the audio semiotic, and edited in Wordfoto. 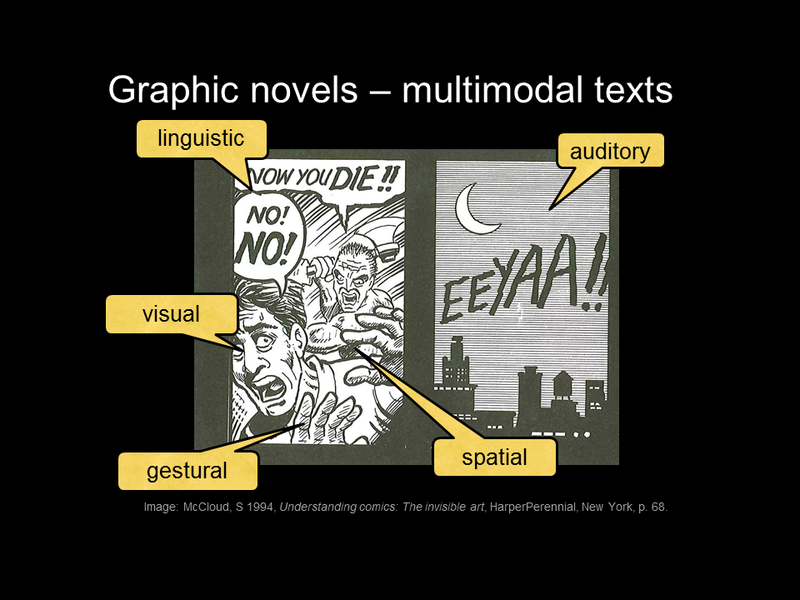 Once the students had explored each of the systems, we focused on the visual and spatial semiotics, particularly on camera angles and types of shots, as these would be the things the students would have most control over when creating their trailers. 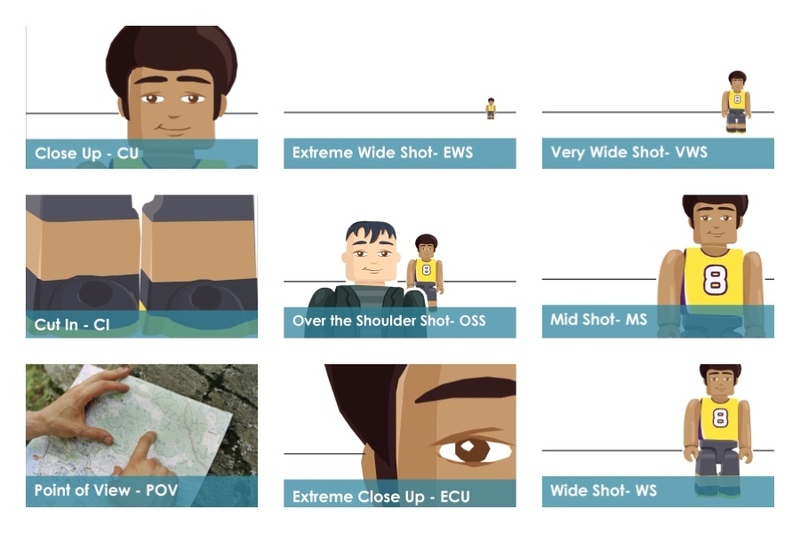 To introduce the idea of different camera angles and shot types, we used a series of flashcards which depicted each of the main types of shots used. Students then watched the Tyre Commercial again, identifying the different shots, and then created their own, using Lego figures. These are the flashcards used to teach students about different shot types. The images the students created using the Lego figures were then shared with the group, and we evaluated them using the 2 stars and a wish strategy, where students shared two things they liked and one thing they would improve about their shots. 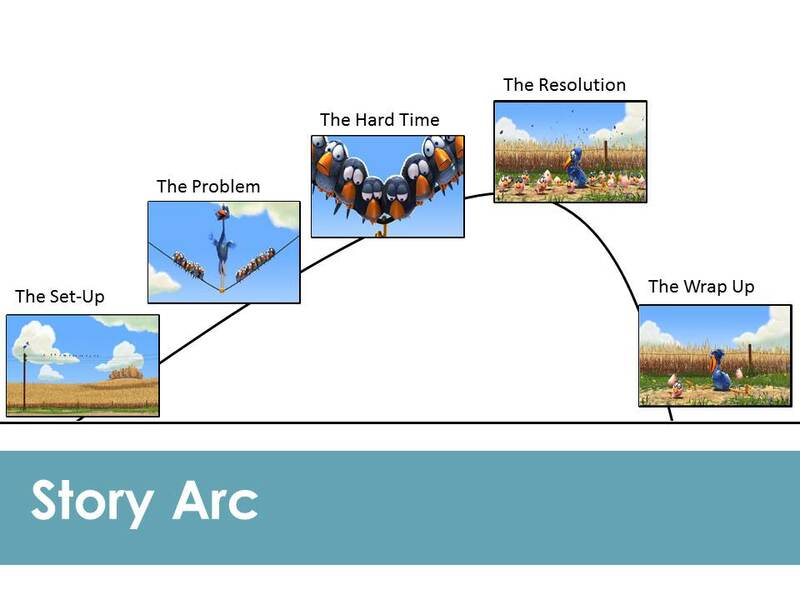 The story arc sheet, completed with images from ‘For the Birds’. 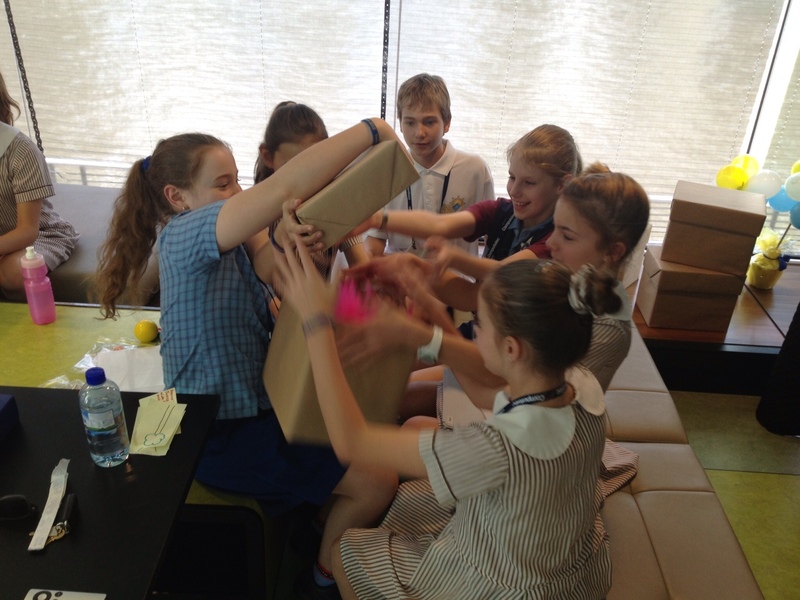 Now the students were ready to receive their mystery box! Inside the mystery box were a range of props and a well known quote from a movie. The students were challenged to use at least one of the props as well as the quote in the construction of their movie trailer. Creating a movie trailer meant that the students had to plan the entire movie using Storyboarder, and then draw from this plan the key ideas which they would include to tempt viewers to see the film. After taking time to plan their story and scout for locations, the students dove into film making, applying their new knowledge to create trailers that displayed a wide range of film techniques.